Here is Riolis Wool threads for Pattern Maker. I tested it with 4.04 and 4.07 ver. You need to: download palette in to your computer. 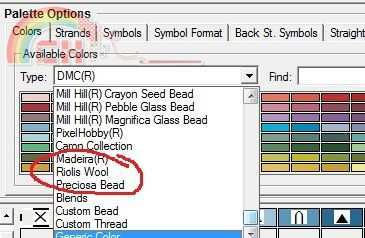 Unzip it and copy it to the " Color" folder where the instalation with Pattern Maker is (Win 7 it's usually C:\Program Files (x86)\HobbyWare\Pattern Maker for cross stitch \color ). Rememer to have administator rights. If you have palette in PM, but you still have a problem with opening xsd files with Riolis wool threads (I had). I downloaded latest version of Pattern Maker (4.07, I post it today), there is a possibility to instal it in russian language. Do it. Open problematic file, it should worked this time. Re-instal Pattern Maker for english again. Thank you for the palette! 2019-4-20 20:52 GMT+8 , Processed in 0.091912 sec., 27 queries , Gzip On, XCache On.